Dr. Naik has immense experience as an Onco-surgeon in treating all types of Cancer patients in leading centers in Delhi and Gurgaon. As a Professor of Medical Oncology, he has expertise as a best breast cancer surgeon. He trained in surgical oncology from the prestigious Institute Rotary Cancer Hospital (IRCH), All India Institute of Medical Sciences (AIIMS), New Delhi and considered as one of the best breast cancer surgeon Delhi and Gurgaon region. He has over 21 years of experience of satisfied patients in his field. He has performed more than 12000 onco-surgical operations since 1996. 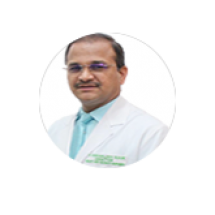 He has successfully done various complex onco-surgical operations including laparoscopic and thoracoscopic procedures. He has been an invited faculty at various international and national conferences. He has published numerous papers and research articles in journals of national and international repute. He has also been a guide and mentor to DNB Surgical Oncology training programme. He has a keen interest in advancements in oncology and was an investigator in a phase III Clinical trial.